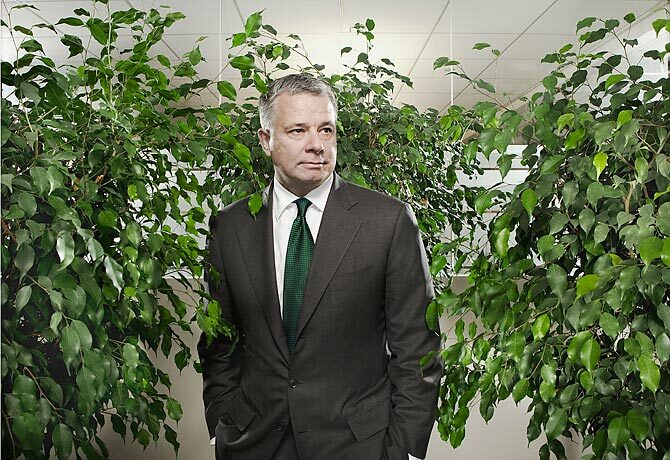 Kevin Parker, Deutchbank's head of Asset Management. A Billboard just outside New York City's Penn Station railway hub advertises something very scary, but it's not the latest Saw horror film. It's a digital readout, the number spinning upward almost faster than the eye can catch: it's currently above 3.6 trillion. The sign is a constantly updated calculation of the metric tons of carbon dioxide in the atmosphere. Like the National Debt Clock that tried to goad an earlier generation to take action on fiscal prudence, the Carbon Counter is a visual reminder that the world is getting warmer all the time, that our industrial activities are the cause  and that global warming is in danger of spinning out of control. It's an effective bit of climate advertising, but what's surprising is that the Carbon Counter isn't sponsored by an environmental group, a university or even Al Gore. It was put up on June 18 by the financial group Deutsche Bank. At a time when many major corporations are still hedging their bets on climate change or even outright opposing government action  see the U.S. Chamber of Commerce's intramural war on carbon cap and trade  Deutsche Bank is forging a different path. The German bank sees climate change as a megatrend over the coming decades, one that will inevitably affect every business and investment  not to mention every person. Those companies  and banks  that can prepare and adapt to climate change ahead of their competition will benefit handsomely. Conversely, those that fail to do so will be hit hard. Carbon will be a new bottom line. "The way around this will be a combination of government regulations and private sector answering the call," says Kevin Parker, global head of Deutsche Asset Management. "Investors will have a huge role." Based in ultra-green Germany, Deutsche isn't your average investment bank  and Parker isn't your average investment banker. A wealthy environmentalist, he bought a vineyard in the south of France in 1997 and began churning out organic wine. Yes, it's easier being green when you can afford it. But the focus on climate change that he's brought to Deutsche Asset Management, where he oversees more than $600 billion, has less to do with his personal passions than with a clear-eyed view of the business risks posed by global warming. DB Climate Change Advisors, the firm's global-warming group, has pumped out research that demonstrates just how seriously warming will affect investing. For instance, one report predicted that the planet's caloric needs would rise 50% by 2050, thanks to growing populations, increased wealth and expanding biofuel demand while global warming threatens agriculture by reducing water supplies when more people than ever will need to be fed. "We have to ask whether it's going to be possible to feed 9 billion people," says Parker. "It's clear the planet can't sustain the rate of growth the way we live." But if we adjust the way we live  assuming we do  there will be tremendous opportunities for the companies that can get ahead of these megatrends. In 2006, Parker launched the first climate-change investment funds; today they're worth more than $5 billion. It has invested in energy efficiency, environmental management, agriculture and other areas in the emerging clean-technology field. That's still a comparatively small slice of Deutsche Asset Management's pie. The U.S. fund has done surprisingly well recently, gaining more than 20% over the past year. For climate investing to grow, Parker says, businesses will need a strong, steady signal from government  most likely in the form of a carbon cap. That's why he supports the carbon-cap-and-trade bills up for debate in the U.S. Congress and hopes for a successful outcome at the U.N. climate-change summit in Copenhagen in December. "You have to put a price on it, and then the market will figure it out," he says. Until then, the Carbon Counter will only go in one direction: up.